Mexican food is always a good idea. Have you ever heard anyone say no to a Mexican dinner party? Exactly. These types of feasts are also easy and generally require simple ‘assembling’ instead of actual cooking. *Mexican cooking trick: take a handful of tortilla chips (I use Que Pasa, the only organic, non-gmo project verified chip on the market that’s made with stoneground whole corn and real volcanic lava stone), crumble them up in my hand and sprinkle on tacos etc. Automatically your dish is improved…because texture is (almost) everything. 1. Start by making a batch of Oh She Glows Life-Affirming Nacho Dip, but stop after you’ve completed the ‘cheese’ step (so, don’t add the spinach, onions or marinara sauce). 2. Preheat oven to 400F. 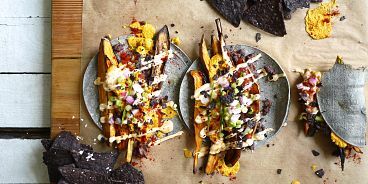 Slice yams and eggplant vertically into strips. Toss with coconut oil (or oil of choice) and garlic, then lay on a parchment lined baking sheet and cook for 25 minutes or until golden. 2. Next, add a can of drained black beans to a small pot on the stove over medium heat. Add the juice of one lime and salt. With a wooden spoon, mash the beans slightly as you stir and cook until soft (about 10 minutes). 3. Heat your soft taco shells in the oven and then begin assembling: add a big dollop of citrusy black beans to each shell, a bigger dollop of nacho dip, roasted vegetable wedges, a spoonful of Que Pasa’s organic salsa, a squeeze of lime, a sprinkling of red or green onions (or both), a fat drizzle of chipotle mayo and — the piece de resistence — a big handful of crumbled Que Pasa Tortilla Chips. 4. Fiesta time! Hope you enjoy. Thanks to Nature’s Path and Que Pasa for sponsoring this post! All opinions are my own. Read more about how this great local company is making a positive difference in our food industry here and head to their recipe centre for more ideas on cooking with tortilla chips and salsa.